Our closest friends in China ( or elsewhere, for that matter ) were Liang Ssu-ch’eng and his wife Lin Whei-yin , two people who combined the Chinese and the Anglo-Saxon cultural traditions. "Some two months after our wedding we met Liang Sicheng and his wife Lin Huiyin. Neither they nor we were aware that years of close friendship lay ahead，but we were captivated from the first." "I did not think once that I could have a friend in a woman. It is my luck to have met you. Because otherwise I may never know and enjoy this certain warm flow of feelings between two women." "Leaving friends like the Liangs was traumatic. We had learned from each other and given each other all we could. Phyllis had become the closest friend to both of us. Our departure was a real heartbreak." "While I am typing this, begging for books, I discovered Phyllis writing Wilma for old clothes. It seems we actually turn beggars!" Liang Sicheng (1901-1972)is a famous architect, architectural historian. Lin Huiyin (1904-1955) is the first female architect in China. She’s also a poet. They committed their whole lives to the exploration of the national style of architecture design and construction, and the protection of Chinese ancient architectures and cultural heritage. 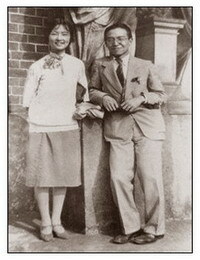 Lin Huiyin, (1904-1955), an outstanding female poet and architectural historian from the first half of the 20th century in China..
Xu Zhimo met Lin Huiyin by chance in the London International Union. Liang Sicheng and Lin Huiyin committed their whole lives to the exploration of the national style of architecture design and construction, and the protection of Chinese ancient architectures and cultural heritage.